The Guild awards an annual scholarship to provide the opportunity for Guild members to develop their skills and expertise. Multiple awards may be given, up to a total combined value of $5,000 per annum and a maximum of $3000 per project. Applications for 2012 close on 26 August and successful applicants will be announced at the Guild Annual General Meeting in September 2011. For more information, visit the Guild website. The Country Tutor Workshop Program was established for the benefit of country and regional members of the Guild. The program aims to provide access to instruction and ideas to enhance and develop the quilting skills of those members who cannot easily attend the city workshops and showcases. At the time of application the applicant, ie the group, must have been a Guild member for at least one full year. It is preferable that any workshop participants outside the group are also members but this is not mandatory. After receiving funding for a workshop the group may not apply again for 2 years. Applications for 2012 close on 31 August 2011. For more details and an application form, visit the Guild website. Membership of the Guild is open to anyone with an interest in patchwork and quilting. Beginners, professional quilters and those that simply admire the craft are equally welcome. By joining the Guild, you obtain access to all membership entitlements for your membership level as set out in detail on the Membership Categories page. As from 1 July 2011, a joining fee of $15 will apply to all new memberships and lapsed memberships that are not paid by 30 September. All membership fees are due 1 July each year and cover the financial year 1 July to 30 June. Download a Membership Application Form. For more information, visit the Guild's website. Braidwood Quilters Inc will be holding their Quilters' Country Luncheon on Wednesday 4 May. The guest speaker will be Dr Annette Gero. Venue: The National Theatre, Wallace Street, Braidwood. Bookings are essential by email. The sixth annual Springwood Community Quilt Show will be held from Friday 29 April until Sunday 1 May at Springwood High School Hall, off Grose Road at Faulconbridge. There is easy access off the Great Western Highway - turn right at the lights and sign for the Norman Lindsay Gallery. 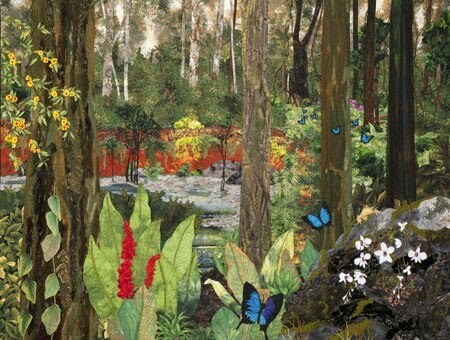 Local Faulconbridge quilt artist, Petal Davies, has designed a unique pictorial wall hanging as this year's raffle quilt, which depicts the famous Three Sisters at Katoomba. The show will include displays by two local quilters, Karen Cunningham and Isobel Lancashire. Nine sewing-related businesses will also be trading at the show, so be prepared for some excellent shopping opportunities. Show hours: Friday 29 and Saturday 30 April 9am-5pm, Sunday 1 May 10am-4pm. Enquiries: Phone Robynne on 02 4758 8869, view the show blog or email the organisers. Congratulations to Roslyn Moules who was presented with the the Lut-Da Award at the Australasian Quilt Convention last week. The Award goes to a quilter who has made an outstanding contribution to their local or quilting community via the medium of quilting. For many years, Roslyn has led the Guild's Community Quilts project, in which members meet to sew quilts for people in the community. Each year over a hundred quilts are given to community organisations. Roslyn's commitment to Community Quilts as project co-ordinator has been recognised by this Award. Congratulations to Kay Haerland, whose quilt Under the Canopy won the Australian National Quilt Award, sponsored by Bernina. 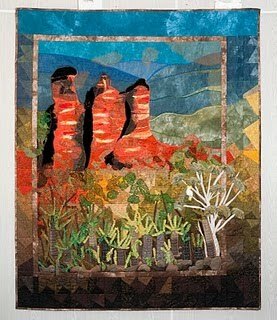 The Award is presented to the maker of the quilt that is judged the best from the Best of Show quilts from the annual state guild shows around the country and was presented at the Australasian Quilt Convention in Melbourne last week. Kay's quilt won Best of Show at the 2010 Sydney Quilt Show. Visiting the Royal Easter Show in Sydney? Look out for quilt making demonstrations by members of the Guild on 18, 19 and 20 April, 9.30am-5.30pm. The Gala Opening night of the Berry Quilt and Craft Show will be held on Friday 29 April 2011, between 7.30pm and 10pm. The Quilt and Craft Show will display 150 quilts and there will be stalls and a cafe. The show will be open on Saturday 30 April and Sunday 1 May 2011 at the School of Arts, Alexandra Street, Berry (on the NSW South Coast). Opening hours are 9.30am- 4pm. There is a $5 entry fee for adults and free entry for children. All welcome!